The Find field allows for very efficient, powerful and quick searches. In this field you can enter all search criteria that you can also enter in the individual fields (see the section Find module). However, the Find field can be more efficient, because you can enter and modify what you want to find without having to switch between fields. This can be very, very fast. There are a few things you need to know. Actually it is very simple, because every time you enter find criteria in the individual fields of the Find module, the correctly formatted string is automatically entered into the Find field. This works both ways; anything you enter in the Find field is shown in the individual fields, as it is interpreted. What makes the Find field so powerful is that you enter what you are looking for in any order you like. 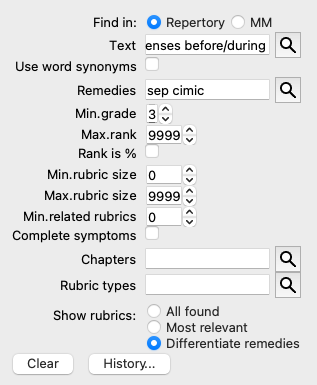 So if you find too many rubrics, simple type a few more terms to reduce the result. You can even repeat criteria you typed earlier in the field; the latest interpretation is taken (grade, rubric size). You can even combine the use of the Find field with the individual fields. Whatever you change at one location automatically reflects in a change at the other location. Text Text fragments are automatically interpreted as text, like you type it in the individual Text field. The same usage of /, + and - applies here (see examples in the section Find module). In the example above, searching is done for the word menses in combination with either before or during. Remedies Remedy abbreviations have to be ended with a dot. In the Remedies field this is optional, but here you must end with a dot to avoid confusion between text fragments and remedy abbreviations. (Confusion example: sep could mean either sepia or separation). The same usage of / and + applies here, see examples in section Find module. In the example above, searching is done on either sepia or cimicifuga. Note: even remedies that by themselves are not an abbreviation (like Apis or Bufo) need to be ended with a dot (apis. bufo.). Gradation Minimum remedy gradations 1 to 4 can be specified by entering *1, *2, *3, or *4. This expression can be read as: All (*) requested remedies need to have this grade or higher. Alternatively, the numbers 1, 2, 3 and 4 without the * are interpreted as minimum remedy gradation as well. So 4 is the same as *4. Rubric size Minimum and maximum rubric size can be specified by a number, preceded by > or <. <50 means 50 remedies or less. >10 means 10 remedies or more. Alternatively, any number starting at 5 and higher is automatically interpreted as a maximum rubric size. So 50 is the same as <50. Let's extend the example above with a restriction to rubrics that contain at most 50 remedies. menses sep. before / during 3 <50 cimic. In the last example, you see how the initial gradation of 2 is replaced by 3 later on, and the maximum rubric size of 200 is changed into 50. This might seem confusing in an example, but is actually very efficient while you are searching and want to narrow your results as you search. You can type a new criterium without first having to remove the previously entered criterium; the last simply overrules the first. =dog will find dog, but not dogmatic. *ation will find palpitation as well as perspiration and ovulation. "he is" will find only he and is if they are in that exact order.